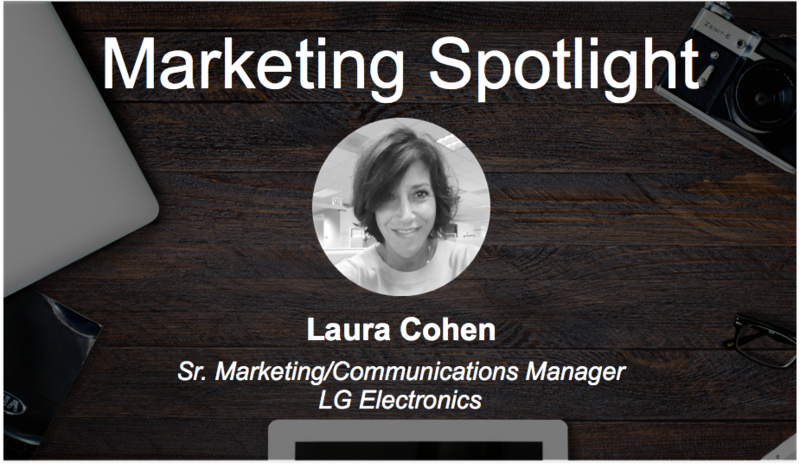 Laura Cohen is the Sr. Marketing/Communications Manager of the commercial division at LG Electronics USA, Inc. She grew up in Deerfield, IL and enjoys: working out, snowboarding, cooking… not baking 😉 and music. Why did you decide to get into marketing? Was there a defining moment when you picked this career? I was lucky enough to be selected to be an intern at Domino’s when I was in college (U-M, Ann Arbor). Everything about Domino’s was about marketing; the building, the wall colors, the messages and it all just kind of clicked for me. What marketing initiatives are you working on right now? Anything unique? We’re starting to get into Augmented Reality (AR) which will open a whole new world for us and our products. The more customers and/or prospects can interact with our products in a real setting; the more they feel that we’re offering the right, best product or solution just for them. What digital marketing channels have you implemented in order to help grow your business? Social, digital programmatic, online forums – I see how creating communities really helps expand the conversation. It allows us to listen to what’s on our customers’ or prospects’ minds. Which specific channels have been most effective for your business? Online communities, email of course, and our website where we host videos, tips and tools. How does your company use data to determine marketing strategies? We segment our files and use metrics to iterate and optimize on a regular basis. This helps us drive better leads down the conversion funnel. The more targeted we are with our data and segments, the stronger results we see. Which tools does your company use to manage marketing initiatives? What is the biggest benefit of partnering/working with an agency? The biggest benefit is the collaborative spirit and an “outside” view. Often, when you are “in” your business you take certain things in messaging or imaging for granted. That outside perspective can bring the focus back. How do you form great partnerships with your agencies? A good vendor relationship is all about open and honest communication at all times, mutual respect and the ability to compromise for the good of the project or brand. What are you most excited about in the marketing industry? Dynamic, interactive content and the new Augmented/Virtual Reality world we are entering. Failure is part of the marketing “gig.” You learn the most when things don’t go quite right. If you are agile enough, you can iterate and make correction. This is why data and analytics are so important. You constantly test our your hypothesis based on data, but sometimes it just doesn’t work out how you planned it. Certain marketing messages, content pieces, and so on might not resonate as originally thought. Give the readers the best marketing advice you have. Learn to make decisions and stand by them; don’t waffle. You can always test-fail-learn. Action is better than passivity. You can’t please everyone or every customer. You don’t need to. I try to create a daily routine; check project status, check my dashboards, see if fellow team members have any hot issues before I get started on my daily work ahead of me. Recommend a great marketing book! I’m Adam Akers, and I’m in charge of strategic partnerships at MWI. We are big believers in business karma. Of course we partner with companies when it’s a good fit, but we love to help everyone out by sharing information. We want to help build a great marketing community where we learn from one another. If I can help in any way, let me know!